Will President Higgins seek a double instead of a single…? This column on whether President Higgins will run for a second term comes from Sept 25th and first appeared online on Broadsheet.ie. To have voted in just one presidential election you would need to be at least 24 years of age now. To have voted in at least two of them; you would now be 38, at minimum. If you voted in three presidential elections you are at least 45 and if you voted in four, then the very youngest of you will be 60 before the next one. That, of course, is if there is a next one. Though I personally think there will. If today’s Ireland Thinks/Irish Daily Mail poll is correct, and there is no real reason to assume it isn’t, then 76% of us would like President Higgins to continue on after his first term expires in late 2018. Besides our Fianna Fáil backgrounds, Sean Gallagher and I have something else in common: an errant tweet has contributed to us both losing out on a job. In my case it partly caused me to lose a job I already held. I was Willie O’Dea’s adviser and programme manager when Dan Boyle sent his infamous tweet. Its claim that there would: “Probably be a few chapters in this story yet” proved baseless, nonetheless 24 hours later the Minister had resigned and yours truly was clearing out his desk. C’est la vie. The tweet only brought the inevitable forward by twelve months. In Sean’s case the broadcast of a bogus tweet during the Frontline Presidential Debate played a major play in derailing his campaign and denying him the job he wanted. Yesterday the Broadcasting Authority of Ireland gave its verdict on his complaint against RTE, The Frontline and The Pat Kenny Show. It was a fairly damning judgement. The BAI found that Sean Gallagher had been treated “unfairly” on three counts. One: by the broadcast of the initial bogus tweet from an account that purported to be from the official Martin McGuinness for President campaign. Two: by the failure of the Frontline to tell the audience of the subsequent tweet from the official McGuinness campaign denying that it had issued the bogus one. Three: by the continuing failure of the Today with Pat Kenny radio show the next morning to properly clarify the status and background of the two tweets. Given that it found that a programme that was intended as a Presidential Debate was unfair to one particular candidate, it was amazing to see the BAI go on to say that no further investigation or inquiry is required as the complaint “was not of such a serious nature as to warrant an investigation or public hearings”. It is not as if this might have affected the outcome of an election or anything….. oh, hang on a minute…. Yes, it might. No one can definitively state whether the tweetgate affair altered the outcome, but we do know that Sean Gallagher was the poll leader before the debate and he wasn’t a few days later. We also know that tallies of the postal votes – ie those votes cast and returned to the presiding officers before the Frontline debate – showed Gallagher topping the poll. On the other hand, it is entirely possible that viewers watching the Frontline debate might have switched from Gallagher to Michael D Higgins even if the tweet had never been mentioned. All this is in the realms of speculation. What is not speculation however it that someone sent that tweet to undermine the front runner and affect the race. So, yes, this matter does require further investigation. The BAI has determined that Mr Gallagher was treated unfairly in how the tweet was handled. RTE’s Director General made a sincere and genuine apology and the RTE Authority is to examine the BAI’s finding. This is all right and proper. But RTE’s actions are only part of the case. Like others watching the campaign on the internet I was not aware of the difference between the real and fake McGuinness for President twitter accounts until the controversy broke that night. The question remains: who was responsible for sending out the tweet? Are we going to tolerate a situation where an election outcome can potentially be so easily influenced by one person or group of people acting in the shadows? We have seen thousands of people protest on the streets of Moscow regarding accusations that Putin rigged their Presidential election, are we not to try and look a bit deeper into this case? Isn’t the integrity of our democratic process worth a bit more effort? Thus leaving Gay Mitchell as the last man standing…..
And then there was one. It is just over two and a half years since we elected Gay Mitchell, Proinsias de Rossa and Joe Higgins as our three MEPs. Within eighteen months Joe had made his way back into the Dáil. He waved goodbye toBrusselshis seat was taken by Paul Murphy. (No, I don’t know much about him either). Fast forward another twelve months to this week and veteranDublinMEP Proinsias de Rossa announces that he is to stand down and his seat will pass to Dublin City Councillor, Emer Costello. As if to complete the row of falling dominoes, Cllr Costello’s vacancy on the City Council will in turn be filled by someone selected by her local labour organisation. And so, two of the three people who asked us in June 2009 make them MEPs for a five year fixed term have decided to move on or move out. Thus… and who would have imagined we would ever again hear these words…leaving Gay Mitchell as the last man standing. Everything that Joe and Proinsias have done is entirely and wholly within the rules. Casual vacancies arising from MEPs dying, resigning or otherwise being disqualified are filled this way. It applies across the EU. It is arguable that this method of filling occasional vacancies is fairer and more democratic than the by-election route. The people’s decision on the five year mandate of their MEPs made in 2009, by proportional representation, is allowed to stand for the duration. Nonetheless, it is disappointing that some of those who contested the Euro Election so fiercely can so easily renege on their mandate mid way through the term. I won’t dwell on this point as I cannot claim to be an impartial observer on this aspect having worked on Eoin Ryan’s 2009 campaign. The point I will comment upon is broader. It is the degree to which these seats are becoming the property of the political party in a manner that starts to resemble the introduction of the party list system. This may look like a big extrapolation from just one or two co-option processes, but when taken together with recent commentary from Prof David Farrell and others on changing Dáil sitting times to drag TDs away from constituency work, then the leap may not seem so great. One of the particular features of our multi-seat PR/STV system is the level of personal attachment and connection between Public Representative and voter. This can often transcend party affiliation and may even be said to be on the increase. Yet there is a curious clamour for this personal connection to be broken. The accusation of the parish pump and cliental-ism is made TDs are said to be so obsessed with getting re-elected that they encourage constituents to think that entitlements they were due were only won thanks to the intervention of the TD. They argue that TDs should be spending their entire working week legislating and debating. They miss the risk that such a system would just institutionalise the control of party hierarchies. TDs based in Leinster House Monday to Friday, doing virtually no constituency work for almost five years would be dependent on the national party structure to get them re-elected. Bad news for mavericks. Not to mention the loss of to our system of representative government. How else can you represent people if you do not spend a good proportion of your time meeting with them and really learning their concerns? Like all things; there is a balance to be struck. You cannot have TDs who only see life through the prism of how it will affect their re-election chances. But going to the other end of the spectrum is not the answer either. You don’t learn much by sending out glossy 8 page A3 newsletters every six months. You got to get out and knock on doors. There is no point speaking in the Dáil if all you are churning out is what you found on Google; read from a focus group or what popped into your head over night. The personal connection between the elected and the elector is important. Anything that diminishes it, undermines the democratic process. Though I never voted for him (not even a 3 or 4) I will be sad to see Proinsias quit the stage. I wish him well. This was written for the Evening Herald of Mon Oct 17th. There are ten days to go until polling day in Aras11. That means that two thirds of the campaign is behind us and, if the polls are correct, so are two thirds of the candidates. Michael D Higgins, who has been in the top two in the polls almost since the beginning of the campaign, is now joined at the top of the poll, by Sean Gallagher. Indeed he is not merely joined at the top of the poll by Gallagher; he is surpassed by the independent who appears to have caught the big momentum just at the right point. The curious thing about the last RedC poll is that Gallagher’s surge has not been at Higgin’s expense. Both candidates actually increased support. In a role that may not sit too comfortably with him or the Labour Party, Higgins is becoming the traditional mainstream established party candidate while Gallagher is taking the role of non establishment figure garnering the non-party and independent backing. Around 50% of voters have backed an independent candidate since the start of the campaign. With ten days to go they now appear to be backing the independent candidate who seems the strongest and has the best chance of winning. This trend had begun to emerge in the last RedC poll on October 6th. While 21% of voters said in that poll that they were likely to vote for Gallagher, only 5% said they thought he could actually win the race. His emergence as a front runner among the independents in that poll has seen him take support from other independents, like Davis and Norris. They will now need to fight hard if they are to have any chance of putting in a decent showing. Gallagher would also appear to be getting considerable backing from remaining Fianna Fáil supporters, something he had not been achieving before this. The latest RedC poll does come with the health warning that it was conducted just before last Wednesday night’s Primetime debate with Miriam O’Callaghan. That was not Gallagher’s greatest moment, though RedC researchers believe that these debates are not having significant impact in the results in their polling. There are two other interesting features in this poll. The decline in support for Martin McGuinness must run contrary to what the Sinn Féin big strategy. He had appeared to be holding his support in the face of a fairly constant barrage about his past, mainly from Gay Mitchell and Fine Gael. Then along came David Kelly. In one short but painfully honest encounter he encapsulated in a harrowing personal story what others had been trying to say abstractly. The fall in McGuinness’s support makes his Mansion House fiesta now look like Neil Kinnock’s ill judged Sheffield rally. The other is the continuing decline in support for Gay Mitchell. I am personally at a loss to explain this, except to return to the analysis that this race for the park is turning into a competition between the strongest traditional party candidate: Higgins and the strongest independent candidate: Gallagher. While Gallagher is cannibalising independent support on one side, Higgins is doing the same on the traditional party side – and at Mitchell’s expense. I live in what would be regarded as a true blue Fine Gael area. In past local and general elections I have been inundated by Fine Gael canvassers and leaflet drops. This time: nothing. Apart from the infamous “Litir Um Toghacan” I have not received once call, one leaflet or one attempted contact from the local Fine Gael organisation, and these are people who know Gay Mitchell well. A campaign that cannot even convince its own activists and core supporters can only be described as an unmitigated disaster. The one ray of hope from the polls for Mitchell is the enormous volatility there has been in recent weeks. Yes, the voters would seem to be splitting into two camps, one pro party, the other anti-party, but within those camps they are still volatile. All could change in the last week with one big revelation or story on either side. When the story of this presidential contest is eventually written, presuming it ever actually ends, it will focus on a number of unusual features. One of the most unusual concerns you: the voter. For a sizeable proportion of the electorate this contest is a first. Virtually no one under the age of 32 in this country has ever voted in a Presidential election before. That is roughly 20-25% of the approx 3.2million people entitled to vote. While it is hard to say what precise impact this is having, it may play in part in explaining why this contest not going exactly to plan: well, not to the plans of certain parties. This election should have been Fine Gael’s for the taking. With the exception of Mary Robinson’s 1990 victory, the presidency has been the almost exclusive preserve of Fianna Fáil. Fine Gael has dethroned its old adversary, yet its campaign strategy is sending its candidate’s poll figures into reverse. Another two weeks like this and poor Gay will be in negative ratings. While that may be a mathematical impossibility his getting less than a quarter of a quota and Fine Gael failing to get any reimbursement of campaign expenses is not. Call me old fashioned but I really cannot believe that loyal Fine Gael voters will continue to allow a man who has loyally defended his leader to languish in the polls just ahead of Dana. The problem for Gay is twofold. First, there is no hint of the core support rallying to him. Fine Gael activists have grown accustomed to easy canvasses and getting good responses. They do not relish the thought of having to knock on doors and listen to the flak just yet. Second, the pundits are over estimating the level of that core support. They point to poll findings that Mitchell is getting only 15% of Fine Gael support. This is a slight misreading of the RedC poll in my view. What it has found is that only 15% of those people who voted Fine Gael at the last election are planning to support Gay. Not all of the 36% of the electorate who voted for them in February now perceive themselves as Fine Gael. Many are ex Fianna Fáil voters. They felt betrayed by the party they had supported and now feel free to change allegiances depending on the policies and personalities presented to them. Speaking of Fianna Fáil; the last two polls seem to give the lie to the assertions that Sean Gallagher’s Soldiers of Destiny background would be a millstone. His increased support suggests that many voters are not bothered by his political past. This does not appear to be the situation for remaining Fianna Fáil supporters however. He is only their second choice, behind Higgins. Sean’s increased poll ratings come with a bigger target for his back. Doing well in a poll can be a major risk. Ask Mary Davis. Her surge two weeks ago was followed by an intensive period of dark murmurings and attack. Indeed, Sean was not slow to join in on that. What comes around – goes around. Were her rise and attacks entirely unrelated? Hardly, though maybe it is just the cynic in me. Either that or it is the fact that I am considerably over 31 and have seen my fair share of presidential campaign black ops. Whatever the case, the Gallagher team will be girding their loins, shins and other sensitive regions for onslaught to come. We are just at the half way mark. The field does seem to be dividing itself into two leagues. A premier league which this week stars Higgins, Gallagher and McGuinness and a first division featuring the just relegated Mary Davis alongside Gay Mitchell, Dana and one time premier favourite Norris. But there are still two more weeks to go. There is still a lot to play for, hopefully that the play will be confined to the ball and not the man – or woman. And they say that negative campaigns don’t work….. The presidential campaign is barely a week old and already we have candidates producing P60s showing how much they have earned over the years. This was in response to dark propaganda about earnings and directorships. And they say that negative campaigns don’t work. If we are at this stage just one week into the race then it cannot be long until the demands come that this candidate or that one produces their birth, baptismal or parents’ marriage certs. We should not really be that surprised. Academic/college politics is said to be so much more vicious than real politics because the stakes are so low. It could just as easily be said about Irish Presidential elections. It is not that the office is unimportant; it is that the powers are limited and the office appears to fade into the background once the campaign is over. The fact that Mary McAleese has been an excellent President somehow adds to the notion that it doesn’t matter an awful lot as to who succeeds her. As none of the candidates have so far convinced us that they are cut from the same cloth as her, the debate is slowly turning to which of them will be the least worst. The office of President is so tightly defined and closely managed that almost no occupant could manage to go truly rogue. So, while many people, myself included, have severe misgivings about the possibility of McGuinness occupying the office, the truth is that his being President would not change anything. Martin McGuinness being President will not make a significant difference to anyone’s daily life – apart from his own. The reality of the past decade is that Sinn Féin has been moving steadily to the centre in the North. No sooner do they move into office but they very quickly adopt the policies and strategies of those who were there before them. Sinn Féin in Government in the North is not a thorn in anyone’s side, least of all the DUP’s. They may head up anti hospital closure committees in the 26 counties, but in the North they merrily implement the cuts imposed byLondon. So, while his election may not herald the end of civilisation as we know it, it could send out a very embarrassing signal at this crucial time. Almost any of the other candidates: Michael D Higgins, Mary Davis, Sean Gallagher or Gay Mitchell could each fulfil the role in their own individual ways without causing us any embarrassment or sparking an international crisis. 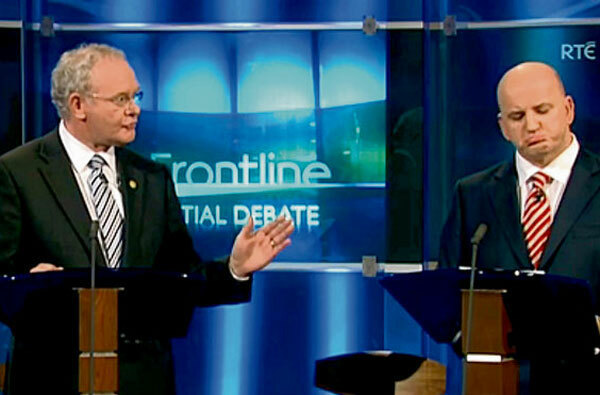 This least-worst approach appeared to be the underlying theme to last night’s TV3 debate. Unlike past encounters, there was some spark to it. The cross talk between the candidates did not yield much and at times became insufferably twee. The competition to be the most concerned by the trauma of suicide bordered on distasteful. It was the questioning and serial grilling by the moderator that managed to reveal something more about each of the candidates. As someone said on Twitter last night, it was not that any one candidate emerged as the winner: it was more that some managed to emerge less damaged and scarred. David Norris and Dana were not among them. Though a veteran of past campaigns, Dana seemed the least prepared and most unfocused. While Norris’s continuing obfuscation in the face of very specific questions from Browne on who it was inIsraelwho had advised him not to publish the remaining letters was telling. David’s protestations that the public will decide this issue ring particularly hollow when he refuses to give them access to the full facts by releasing the outstanding letters. This issue is not going away and the longer it continues the worse he will get for him. His media adviser is a big admirer of Tony Blair’s spin doctor, Alastair Campbell, He should remind his client of Campbell’s famous rule that if you allowed a bad news story to dominate the headlines for more than four days, you are in trouble. David has had more than four days of such headlines and the only end in sight is his own. And, to think, we still have three weeks more of this to go. For the last few months some people have been complaining about how impossible, unfair and stitched up the Irish presidential nomination process can be. True, these were mainly people aligned to one candidate or another, but even so, at least they cannot say now that is not exciting. The massive flurry of activity in Council chambers across the country has been something to behold. Meetings have been called at the last minute in Councils from Donegal to Waterford and from Cork to Dublin. They have become like our very own mini Primaries and Caucuses – mirroring those in theUSAwhere each States holds primary elections to mandate delegates in each of the two main parties to select their respective Presidential Candidates. With eight Councils meeting today, this could be described as our own “Super Tuesday”. Just as in the States, today will decide the fate of the two remaining ballot paper hopefuls. I am not sure if this is ironic or just a symptom of poor campaigning, but one of the candidates, Dana Rosemary Scallon is the last one into the field, while the other Senator David Norris was the first one in, having launched his campaign as far back as March. Back on May 9th Sen Norris was the first candidate to get Council backing, in his case Fingal. He only had to wait a mere twenty weeks to pick up his second one, securing the backing of Laois County Council yesterday. But, as we all know, a great deal has happened in those twenty weeks. Highlighting the drama of his situation only three individual votes yesterday separated the Senator from his goal. First, te lost Carlow Council on the casting vote of the Fine Gael Chairman and then he went on to be defeated in Dublin South Council 11 – 12. Two more votes, or rather two more abstentions, from Fine Gael, Labour and Sinn Féin would have made all the difference. On the other side, Dana managed to take two Councils in quick succession. Norris’s loss in Carlow was her gain plus support from Roscommon. Today she turns her sights on Donegal, Longford and Westmeath, two of which backed her at her previous bids for the office. One indicator of how Councillors might vote at the Council meetings today can be gleaned from last Sunday’s Business Post/RedC Opinion Poll. Fortunately, for sad political junkies like me, the pollsters used two sample ballot papers – one without Norris and Dana on it and another with both included. On the face of it Norris’s nomination today would not only see the race having a new front runner, it would also damage the campaigns of the candidates from the two Government parties. According to the Poll Michael D Higgins could lose up one third of his support to Norris, while Mitchell, who cannot afford to slip much more, could haemorrhage anywhere in the region of one quarter of his support to him. Expect the Fine Gael and Labour Councillors to weight this possible outcome carefully when they consider how they will vote today, particularly when it comes to backing Norris. The outcomes will depend on how these considerations are balanced against the fear of a backlash against those who kept Norris out of the race. Not that Higgins and Mitchell are the only ones affected by an expansion of the field. The entrance of Norris and Dana to the race could see Mary Davis lose up to a third of her support, Sean Gallagher lose about one quarter of his and Martin McGuinness lose about a fifth. In the case of these three, their capacity to influence the outcomes today will not be anywhere as great as for the two main parties. Plus their supporters will also want to size up if the damage done to the FG and lab candidates outweighs the impact on theirs. Later this evening, as our Super Tuesday draws to a close with votes in Dublin Corporation and Cavan County Council we should know the final outcome. But, if not there is always Average Wednesday’s early morning’s meeting of Kilkenny County Council. In about 75 days we will vote for our next President. It is a long way away and there will be plenty of polls to mull over between now and then. The latest RedC Paddy Power poll does throw up some unexpected numbers, so I suspect with the next two or three polls. I would not expect them to settle down and reflect actual voter intentions until much closer to October 27th. Uncle Gaybo tells us that he will make up his mind on whether to run or not. He has some big things to mull over, including his high level of potential support. They are impressive by any standards, almost Norrisian when compared to polls taken in recent weeks. But what do these big numbers mean or matter when the beneficiary is not in or out of the race yet? Plus, he should consider that early leads come with a major health warning from Irish presidential election history. It showed the Labour party’s candidate, Adi Roche in a commanding lead with 38% – ten points ahead of Uncle Gaybo’s figure today. On polling day, on October 30th she ended up on 7%. As with Uncle Gaybo, Adi’s name had come into the fray as a bit of a surprise announcement just days before an opinion poll. The Irish Times poll; published ten days later, had Roche on 22%, behind McAleese (who polled 35% in both polls). I know the dangers of comparing polls from different polling companies with different samples. I also know that Adi’s declining poll numbers followed a tough and difficult campaign. To put it in its crudest terms, this poll seems to me to simply reflect how well the public recognises the candidates’ names, so far. I say this as the truth is that the Presidential campaign not started yet. Yes, there has been a lot of coverage over the past few weeks, but this has focussed on particular individuals rather than the full slate. Apart from a few short one to one interviews on the Pat Kenny radio show and his rather terrible Frontline debate where most of the potential candidates stayed away, there has been no opportunity to calmly judge the candidates suitability to be President. The campaign proper in October will matter. By then we will know who is definitely in the race or who is not. We will start to hear clear messages from each of them why they are the right person to succeed President McAleese. We will hear about their values and their thoughts on what the next seven years should bring. We, the public will be able to assess and review the candidates individually and collectively over that three to four weeks of intensive campaigning. The last thing anyone wants or needs is an 11 week campaign. No one’s sanity, patience or tolerance could withstand 75 days of that. So let us stay calm, wait to see who is in or out and all take a few deep breaths from now until late September when the race can begin in earnest. Aras11: and then there was five, or four…..
With each passing day the Aras11 race increasingly resembles a remake of the 1945 Agatha Christie movie: And Then There Were None. For those of you who haven’t seen the Barry Fitzgerald classic, or its later remakes, the plot revolves around a group of people brought together on a remote and isolated location by Mr U. N. Owen (say it out loud and you will get it). One by one the guests depart. Each in increasingly tragic circumstances, until there is just one is left. Or, is there? Have each of them really gone to meet their maker? Could there be a last minute twist in the tale? Ok, I have done this metaphor to death, but you can see where I am going with it. Labour’s early selection of Michael D Higgins heralded early exits by Fergus Finlay and Kathleen O’Meara. Niall O’Dowd’s withdrawal last week and Avril Doyle’s exit this week has brought the total number of viable candidates down by four. I say “viable” as there are two also-rans seeking Council nominations. Today’s Fine Gael selection convention will reduce the field by a further two – though you will find it hard to get a firm consensus on which two. So what does this all mean? Well, by the close of business tonight the original field will have been halved. Three of these will definitely be on the Aras11 ballot paper: the FG and Lab nominees, plus Sean Gallagher. Two more: Mary Davis and Senator David Norris will be hoping to make it before the final deadline. So it now looks like there will be a field of five candidates when the election comes around in October. Or will there? Will there be one or two more – will there be one less? October is still a long way away. With 33 Oireachtas members, Fianna Fáil has more than the 20 signatures needed and could still choose to support a candidate not already in the race and not necessarily from the Fianna Fáil family. With a total of 31, the Independent TDs and Senators, including United Left Alliance, could also nominate, if they can find one on whom twenty of them can agree Though Norris supporters suggest he has 8 or 9 of them already signed up. While Sinn Féin, with 17 Oireachtas members, would need to get three Independents on side to give a nomination to a person of their choice. Back on the Council trail: the longest declared candidate, Senator David Norris, must be feeling pretty miffed to be overtaken in the Council stakes by Sean Gallagher on 5 and Mary Davis on 2. Gallagher’s relative ease in securing motions of intent would suggest that he and his team were working on this campaign long before he officially entered the race. I know some of his core campaign team. They are very skilled professionals who have run it like a classic Seanad campaign. It is this skill and ability; however, that makes Mary Davis’s victory in Gallagher’s Louth and Monaghan backyards all the more impressive. Her comfortable margins suggests that my mate, and keen political blogger, Jonny Fallon, was right when he tweeted a few weeks back that the other Independents would have to wait until Gallagher got his four councils. Less certain is Norris. He has been waiting for almost two months to follow up on his one success in Fingal Council. It will be interesting to see if Fine Gael is still set on stymieing his campaign. This would be in contrast to the Fine Gael abstentions elsewhere which allowed Gallagher to get through. Maybe Fine Gael fear Norris more than Gallagher, or maybe they just want someone in the race who they can label and attack as a Fianna Fáiler? Who knows, only time will tell – and time, as Agatha Christie observed, is the best killer.